The wind and solar farms simulated in the study would cover more than 9 million square kilometers and generate, on average, about 3 terawatts and 79 terawatts of electrical power, respectively. The model revealed that wind farms caused regional warming of near-surface air temperature, with greater changes in minimum temperatures than maximum temperatures. 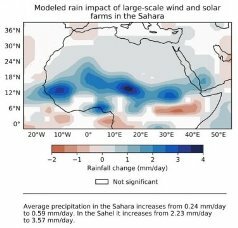 Solar farms had a similar positive effect on temperature and precipitation, the team found. Unlike the wind farms, the solar arrays had very little effect on wind speed.